Having been a Carmelite convent in 17th century and a hospice during the Revolution, this building became a hotel in 1928. It has experienced wealth and welcomed sheathes of “beautiful people”, but for several years the Jules Caesar was slightly run down. 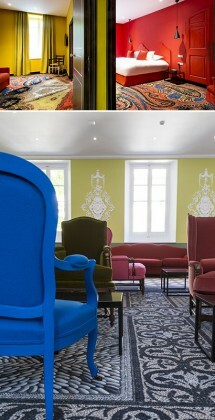 A major face-lift led by Christian Lacroix has just restored it to its former glory – and more! Proud of its five stars, this member of McGallery and the Marantha Group comprises of 52 bedrooms and suites. As soon as you step into the lobby, you can glimpse various little insights into the city; with mock old paving stones, reproductions of works from the Réattu museum on canvas…Upstairs is a little provincial, taking its tempo from the lively colours that recall local traditions: pink old facades, red torero capes…But, on the ground-floor and at cloister level, the atmosphere is monastic! The designer has maintained the original panelling of the restaurant and has even added a frieze, offering hints of Chinese shadow, silhouettes of bulls and Arlésiennes! The Five World/Cinq Mondes label lends itself to the treatment spa and its three rooms, one of which is a double, offering a wide range of treatments from around the world.